Some Trees & Shrubs tolerate or even enjoy wet areas. Here are some of our favorites. Aesculus parviflora Bottlebrush Buckeye. Gallon Shrub. 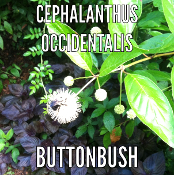 Cephalanthus occidentalis Buttonbush. Round white blooms attract butterflies in early Summer. Gallon plant. 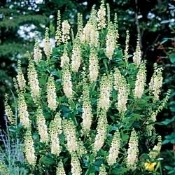 Clethra alnifolia. Summer Sweet. 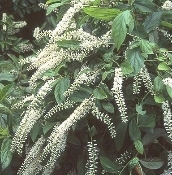 Pepper Bush. Choose from Hummingbird, Ruby Spice, or Sixteen Candles. 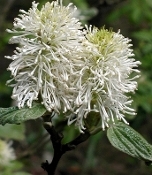 Fothergilla Native Witch Alder. Fragrant Deciduous Shrub. Gallon shrub. Hibiscus moscheutos Rose Mallow. Native to the Southeast. Huge blooms 8-10 inches wide on a 3-5 foot tall herbaceous perennial plant. Currently growing in a 6 inch pot. We remove the pot before packaging for delivery. Price includes delivery. Hibiscus mutabilis. Confederate Rose. Swamp Mallow. Cotton Rose. Gallon plant.